With the recent helium shortage, we are becoming more creative with balloons. 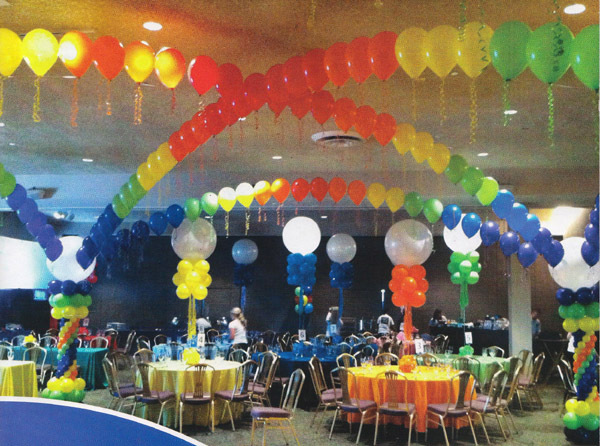 Balloon archways can be made with air filled balloons and suspended from the ceiling. Balloon columns can make a grand statement in a room or at the sides of a doorway. They also can be suspended from the ceiling using nylon suspension thread or PVC pipe. When suspending, tie the balloons together in twos, twist together two sets of two, and wrap around the PVC pole or suspension line. You will find that as you begin to stack them they will “nest” together, leaving no space in between. Put two or more colors together and depending upon how you stack them, you can make a “spiral” effect. If you are interested in a balloon centerpiece, these can be made using air filled balloons, balloon cups, and balloon sticks. They will be colorful and bright, and on the plus side, they will actually last longer. 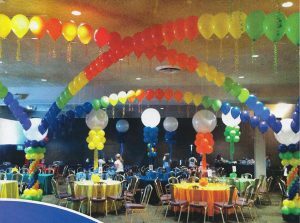 Combining other elements with air filled balloons, such as fluffed out mylar picks, colorful bows, and even smaller balloons can make for an interesting as well as beautiful centerpiece. All you need when using air instead of helium is a way to keep them upright in a centerpiece. That’s where the balloon cup comes into play. Wind the balloon stem through the slits in the balloon cup and pull it taught. 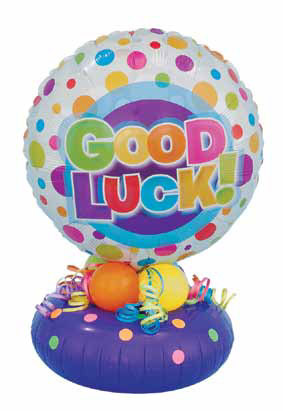 Glue the cup with balloon attached to a balloon stick, a decorated styrofoam disc, or a balloon weight. Cover the balloon cup if you like with some pretty ribbon, mylar paper or tissue paper. The helium shortage may continue for a while yet so it makes sense to utilize balloons in other ways. The possibilities are endless and inexpensive. Just make sure to get a hand pump, or air compressor to blow them up, or you may have to recruit a lot of friends!